Behind-the-scenes as ALVINNN!!! AND THE CHIPMUNKS get a makeover for the new millennium courtesy of Bagdasarian Productions and PGS with a brand new Vector Style Guide. As Bagdasarian’s new hit TV show is now airing across the world, with 4 generations of fans and nearly 60 years of franchise success, it was important to bring a fresh look to the Chipmunk fans. Under the direction of Bagdasarian Productions, the owners of the Chipmunks franchise and producers of the hit show, and Eyerus, a leading creative LA-based agency, we worked on developing this new vector look, along with new themes and vibes, to make the Chipmunks trendier than ever, as they embrace their expansion through product categories. The challenge was to keep the DNA of the original characters through this updated look. The first obligation was not to stray too far from the graphics of the new TV series, but instead to add a touch of style that would appeal to retail consumers. Alvin and the gang have evolved through a variety of styles over the decades, and now they have their own new 2D style that’s full of personality and attitude. What’s also fun for us is creating character designs that speaks to each of their unique personalities. You can see below that Simon is acting responsibly as usual, while Theodore is trying to keep up with his brother. Alvin, of course, being Alvin, isn’t helping his brothers, but is busy doing things his own way. 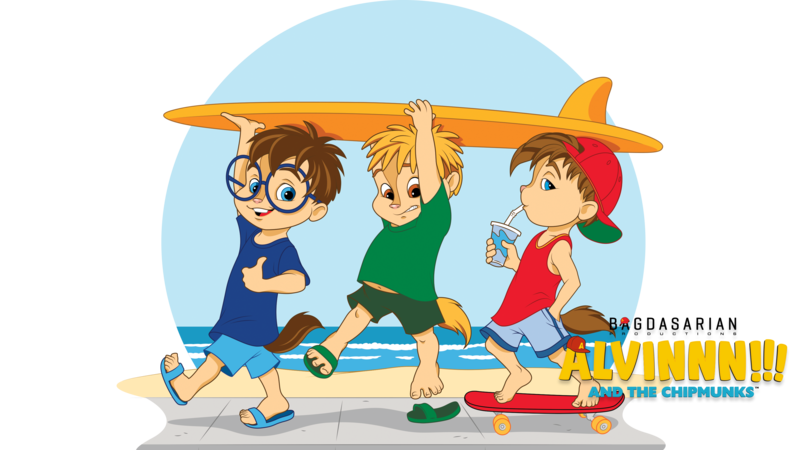 It’s a great Chipmunk theme that you’ll see throughout the guide, like Alvin acting like a boss in the below vector and Simon building the most intricate castle at the beach. We also wanted to be on trend with what’s relevant and use references to today’s pop culture, like “Squad Goals” and “It’s a Foamy Mocha-Frappe Double Caf Sort of Day,” which appeal to millennials, while the vintage and SoCal collections appeal more to an older audience. Images like the Chipettes in yoga class or dancing around at a festival are funny references that transpose the Chipmunk’s universe into the modern era in a way that resonates across a broad demographic. Alvin was quite literally made in California. It was great for us to play on his “So Cal” attitude and illustrate it in a vintage way that would appeal to his four generations of fans. The California effect is something that feels so appropriate for the Chipmunks and so we have built numerous posings and attitudes using this theme. Our mantra was that we always wanted each Chipmunk to do something that was tied to his or her personality. If you look at these posings, they are really doing exactly what you’d be expecting them to do at the beach. Funny, mischievous and musically adventurous, these pop sensations and cultural icons have continued to evolve over the years, making The Chipmunks a pop-culture mainstay. For example, “Alvin House” is a not so subtle reference to the 1978 film “Animal House,” with Alvin’s impersonating James Belushi and Simon and Theodore, his fraternity brothers. Alvin’s “Call My Agent” is another example of a riff on a film with strong pop-culture sensibilities. The characters and the images that we’ve created appeal not only to kids of all ages and adults, but to both boys and girls equally. Do not hesitate to get in touch with us to see the full Vector Style Guide or talk to us about licensing opportunities at info@pgs.media.